Well, this seems to have ended before it began. 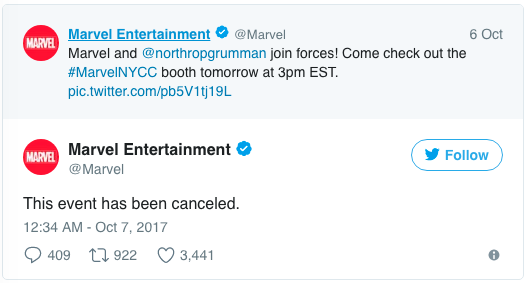 Marvel announced via Twitter that it was teaming up with the “global security company” Northrop Grumman. The announcement was NOT met with cheers. Instead, Marvel was met with strong backlash from fans who felt the move was promoting the military-industrial complex to children and was in effect prompting war profiteering. Marvel had not commented on extent of the partnership prior to its cancellation beyond saying it featured a promotional all-ages comic that teamed the Avengers with the “Northrop Grumman Elite Nexus,” or N.G.E.N., with the tagline “Start Your N.G.E.N.s,” The book included career recruitment advertisements and a contest to be drawn into an upcoming issue. The company sells mostly to the U.S. government, generating more than $20 billion in revenue each year.